Following its departure from the ownership of Orenair airline, Orenburg Airport (the primary airport of Russia’s Orenburg Region located in the southern part of the country, on the border with Kazakhstan) launched local commercial services with L-410UVP-E20 turboprops. The airport is now looking to expand with more spacious airliners on the back of growing regional demand for air services. Orenburg Region’s primary producing industries are mining and agriculture. It ranks 25th among Russia’s 84 territories in terms of tax and non-tax revenue. After separating from Orenair, Orenburg Airport came into possession of 55 fixed- and rotary-wing aircraft, namely Antonov An-2s, Mil Mi-2s and Mi-8s, and Kamov Ka-226s. The airport’s development has been substantially supported by the regional administration, which has been investing in local air services since 2013. The plan for development of the regional air transport system calls for 861 million rubles ($13.3 million at the current exchange rate) in subsidies in 2015-2020. The federal government has also been of help. Orenburg airport, which is certified to perform commercial air services, purchased seven 17-seat Aircraft Industries L-410UVP-E20 turboprops (a derivative of the Czech Let L-410 design) in 2013 and 2014 for its subsidiary airline Orenburzhye. The latter launched regular flights with the type in April 2013 becoming its largest single operator. The airport had hosted several L-410UVP back in the 1980s, so its personnel still have maintenance expertise on the type. This past summer, the airport’s maintenance service became Russia’s first MRO provider to perform a basic maintenance check on an L-410UVP-E20. Orenburg personnel say the aircraft perform normally in spite of the region’s harsh winters. The seven airframes clocked over 200 flying hours on average between them in July. Orenburzhye and Dexter Airlines, the other partner in the program for regional air transportation within the Volga region, carried over 73,000 passengers on 29 regionally subsidized city pairs in the first nine months of the scheme. Orenburzhye accounted for over 70% of all passengers carried. Orenburzhye serves five airports in the region’s eastern part, where the road infrastructure leaves much to be desired. 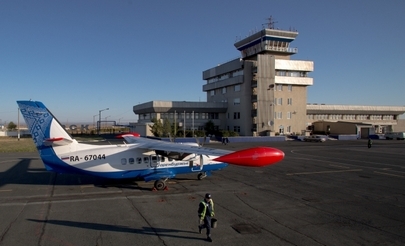 An L-410 takes passengers to Orsk, where they split to catch two connection flights with 12-seat An-2 biplanes getting them to several local settlements. Both frequent fliers polled by Russian Aviation Insider and the head of a local administration say the service is popular and inexpensive. The regional administration supports Orenburzhye’s drive to obtain more spacious airliners. Orenburg Airport commercial director Sergey Korotkov says possible fleet additions may include 50-seat Embraer ERJ145s and 100-seat Sukhoi Superjet 100s. The airport management’s understanding is that Orenair will have problems filling its Boeing 737-800s on the local residents’ most popular routes to the Black Sea and Caucasus resorts, as well as to Novosibirsk, Irkutsk (both in Russia’s Siberia), Tashkent (Uzbekistan), Baku (Azerbaijan), and Yerevan (Armenia).